Gun shots shattered an otherwise peaceful afternoon. Police swarmed as a gun-wielding man stole a city truck and sped through downtown Des Moines, only to end up in a head-on collision with a police car just a few yards from the Science Center of Iowa. As the man was being put on a gurney and loaded into an ambulance with minor injuries, the first accounts of the event were already posted on The Des Moines Register's Web site. Photographers shot images, returned to their cars, uploaded them onto a laptop computer and immediately posted them online. Several updates continued throughout the day, with a final version of the story appearing in the next day's print edition. This, some say, is one of the only ways newspapers can remain relevant in today's world of 24-hour news and information. With falling circulations, increased competition online from TV stations and bloggers and a new generation of Americans who aren't as interested in daily newspapers as their parents, papers like the Register are resorting to drastic measures to ensure their survival. "You either adapt, or you die," said David Yepsen, a political columnist for the Register. "It's very Darwinian." The Register was one of three test sites, along with the Argus Leader in Sioux Falls, S.D., and Florida Today in Melbourne, Fla., for the new Information Center philosophy of its parent company, Gannett Co. Inc. In November, the test period ended and was deemed a success. The approach aims to transform all of the chain's daily newspapers into 24-hour local multimedia content providers, and it's now mandated at all 86 Gannett papers across the country except USA Today. The plan named seven areas that each Gannett paper would be required to embrace: public service, digital, databases, community conversation, local content, custom content and multimedia. "The Information Center is both a philosophy and a structure," said Carolyn Washburn, vice president and editor of The Des Moines Register since September 2005. "The philosophy is that readers use a lot of different types of media, some of it print, some of it broadcast, some of it digital, and there are more options all the time. The daily print newspaper is the biggest thing we do and the most influential thing we do, but there are other things that we can provide with the power of the content we produce." "The newspaper industry can't figure out what it wants to be in 20 years," said Barbara Mack, an associate professor of journalism at Iowa State University and former general counsel at the Register. "Gannett is taking the lead in trying to shape that future." For a third consecutive year, the daily and Sunday circulations of America's newspapers fell sharply in 2006. For the six months ending September 2006, industry circulation was down 2.8 percent daily and 3.4 percent Sunday compared to the same period a year earlier, according to the Project for Excellence in Journalism's 2007 State of the Media report. At the Register, daily circulation fell from 147,699 in the September 2006 Audit Bureau of Circulation report to 146,050 in April. On Sundays, paid circulation fell from 237,870 copies to 233,229. This continued a fall from September 2005, when the daily circulation was 150,201 and Sunday was 241,842. In fact, circulation has fallen virtually every year since 1994, when daily circulation stood at 184,959 and Sunday at 318,542. John Morton, a newspaper industry analyst in Silver Spring, Md., and a columnist for American Journalism Review, said 2007 is also shaping up to be the worst year in newspaper advertising since the Great Depression. "It is a far more complicated industry than when I was involved in the paper," said Charles Edwards Jr., dean of Drake University's School of Journalism and Mass Communication and College of Business and Public Administration and former president and publisher at the Register. "It would be completely irresponsible not to explore new technologies to see if newspapers can stay viable. You can't sit back and twiddle your thumbs." Edwards said that in the early days of the Internet, many people in the industry, himself included, thought driving readers to the Internet meant driving them away from the print paper. "We just didn't see the potential right away," he said. "Newspapers were really slow to adapt to the changing world." Washburn said the idea of the Information Center, a name that has replaced the traditional "newsroom" moniker, is that readers are leaving the print paper anyway, so why not be the ones producing the content they are leaving the paper for? "We give people lots of different ways to access what we do," she said. "Do they prefer it in the format and the frequency (weekly) of Juice? Do they prefer it in the frequency (daily) and format of Iowa Life? Some people want a wide variety of content, and they want it once a day. If that's what you want, then you want the print daily newspaper. 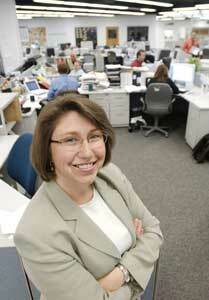 If what you want is information constantly through the day, then you want desmoinesregister.com." And despite circulation being down, readership is up, Washburn said. According to Omniture Inc., the company that monitors the traffic at desmoinesregister.com, the average number of monthly unique visitors to the site is up to 870,232 in 2006, up from 646,248 in 2005 and 513,545 in 2004. "Overall readership is up," Washburn said. "That's the goal. We're reaching people we weren't reaching before or whose preferences have changed. When you put together all the ways people get information from us, our readership is up." For two days last summer, the entire Register newsroom staff assembled in a conference room at the Hotel Fort Des Moines to learn about the way their newspaper was about to change. "Helping the staff understand the philosophy and helping them become part of it was so important," Washburn said. "So we actually did a retreat with the entire staff over two days. The retreat was really about showing them what was changing about the industry and here's the structure and how do we use it to do really fabulous journalism in new ways." Not everyone was completely convinced. "Of course people complained," said Yepsen, who has worked for the paper since 1974. "Any time you change the entire culture of an organization, there is going to be a lot of whining. But I think everyone understood that our business has changed and we just can't go back to the 1950s. We have to embrace the change." "If [Eastman] Kodak [Co.] decided it was not going to get in the digital game at all and it was going to stick to film, Kodak would be a completely dead company today," she said. "For a newspaper company, you can't look at the daily newspaper in isolation anymore and say the company is successful or not successful based only on the daily newspaper." Some people worry, however, that the changes that could save the newspaper as an economically feasible business could damage the institution's journalism. "I have a fear that this will turn into newspapers not doing as good a job at the job only a newspaper can do," Morton said. "I shudder when I read some papers, because there just isn't much in them anymore." As circulation decreased and competition from the Internet pulled classified and other advertising away, most papers began shrinking the space they dedicated to covering news, Morton said. Add to that the idea of "hyper-local" coverage, where a paper closes statewide bureaus and turns its entire focus to local news, and you have newspapers that have lost not only readers but also once-proud reputations, he said. "The Des Moines Register used to be counted as one of the best papers in the country," Morton said. "It doesn't stand as tall anymore, but that can be said of all of Gannett's newspapers." Mack said with corporate ownership of most newspapers, the drive for higher profit margins fuels decisions more than good journalism. "It should give people pause that it wasn't a media outlet that uncovered the (Central Iowa Employment and Training Consortium) scandal, it was a whistleblower," Mack said. "There are probably others that we aren't finding out about. I'm afraid we're turning the watchdog into a pussycat." Fewer people are doing more work, which could lead to sloppy reporting, Mack said. Also, money is being poured into multimedia and entertainment reporting that used to go to things like investigative journalism. But newspapers are still an extraordinarily profitable business, Morton said, with profit-margin percentages in the high teens at most papers. "Four years ago, most operated with a 22 percent margin," he said. "Today, it's in the high teens. It's still high, but it's definitely moving in the wrong direction. This tends to make shareholders a little restless." Gannett's stock price has fallen from $90.48 in January 2004 to a recent close of $55.48. Washburn said those fears are unwarranted. "I don't want people to do dumb journalism," she said. "I want them to have the tools to do journalism thoroughly online in addition to what they're doing in print." She said that though the workload has increased for some employees, as they now must update stories throughout the day, write a blog or shoot video, policies aren't applied blindly across the board. "Clark Kauffman, our investigative reporter, is not doing tons of updates during the day and not shooting video. It's not the nature of his job," she said. "But Tom Alex, our morning police reporter, shoots pictures and does 10 updates by 9 a.m. That's the nature of his job. We're trying to equip reporters with laptops, cameras and digital audio recorders ... all the tools reporters should use when they are appropriate." Washburn said anyone who ever worked for an afternoon daily, which prints several editions of the paper throughout the day, or a wire service like the Associated Press, with constant updates of stories throughout the day, had a workload exactly the same as what is being asked of current staff members. "It's really no different, just with some new tools to help tell the story," she said. Despite an uncertain future, nearly all agree the print newspaper will exist in some form at least in the foreseeable future. But the changing world cannot be ignored. "The printed paper isn't going away," Yepsen said. "It just won't be the only thing we do." Edwards said the jury is still out on how successful Gannett's new initiative could be. "The industry is certainly keeping an eye on its success," he said. "Gannett has certainly made a commitment to trying to take newspapers into the 21st century. I still see a very positive future." "Newspapers aren't going anywhere," he said. "But the transition to the Internet will be bumpy. I think the Internet will one day become where newspapers make all their money. It's just going to take some time to figure out how to get there."